For Cleanliness Tape Test ISO 8502-3 as mentioned in Procedure 6.2b. Inquire About Special Web Pricing! 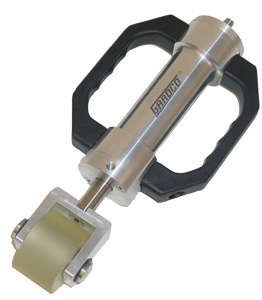 Uniform pressure can be applied to the cleanliness tape by means of the Gardco Cleanliness Tape Roller. The top of the Red indicator ring is calibrated to 4kg (39.2 N) while the bottom indicates 5kg (49 N) force calibration. The CTR is made of selected materials that provide basically maintenance free service until components wear out. We do not recommend lubrication in any areas. This also will prevent contamination of the tape or test area from excess lubrication. The CTR external surfaces can be cleaned with a non-chlorinated solvent (Ensolv, etc.) or spray cleaner (409, Spray Nine, etc.). The CTR should not be immersed in a cleaner. Adhesive Tape - consisting of virtually colorless, transparent, self-adhesive, pressure sensitive tape with adhesion strength of at least 190 N/m. Purpose: Dust on blast cleaned steel surfaces may reduce the adhesion of applied coatings and by absorbing moisture, may promote the corrosion of the blast cleaned steel. First discard the first three turns of tape from the roll. Remove a piece about 8" long. Touching the adhesive side only at the ends, press about 6" of freshly exposed tape firmly into surface to be tested. Press by placing the thumb across one end of the tape and moving the thumb along the tape at a constant speed and pressure. Do this three times in each direction making each stroke take approximately 5 to 6 seconds. 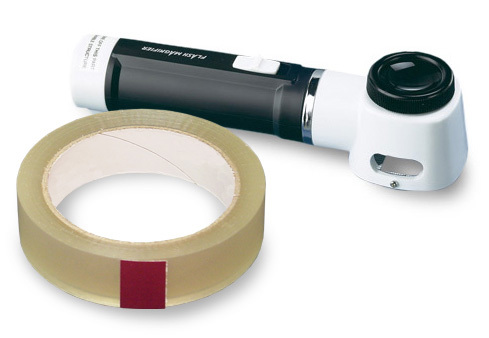 NOTE: While a test procedure in which pressure is applied to a tape using the thumb is subjective, it is usually adequate, especially for use in situations where surfaces free from dust are required. In disputed cases, except when a rust grade C or D is involved, pressure may be applied to the back of the adhesive tape using a spring-loaded roller. Please refer to ISO F502. Remove the tape from the test surface. Display results on an appropriate contrasting background card, tile or paper by rubbing with thumb to adhere. Determine the QUANTITY OF DUST on the tape by comparing visually an area of the tape equal to an area of reference shown in FIGURE 1 below. Determine the predominant DUST PARTICLE SIZE on the tape by referencing TABLE 1, which defines six dust particle size classes, designated 0, 1, 2, 3, 4 and 5. Complete a significant number of tests to properly identify the characteristic of the surface tested. Complete at least three separate tests for each surface of a particular type of aspect. Complete at least two additional tests for each result that has a one or less quantity rating. Pictorial references corresponding to dust quantity ratings 1, 2, 3, 4 and 5. NOTE: The use of intermediate half-steps is permissible if required to give a more detailed report. Report any overall discoloration as quantity rating 5, size class 1. 1 Particles visible under X 10 magnification but not with normal or corrected vision (particles < 2 mils in diameter). 3 Particles clearly visible with normal or corrected vision (particles up to 40 mils).